Smokehouse Chef | Have YOU Ben Starr Struck? 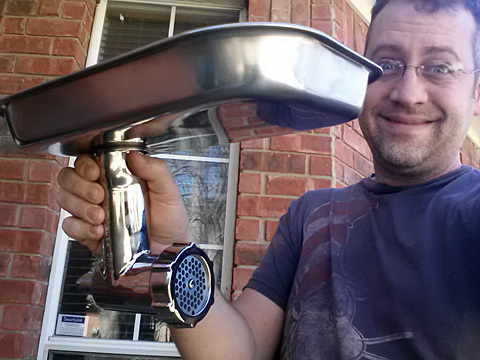 **This is an objective product review of a meat grinder I recently purchased. I have no affiliation with either Kitchenaid or Smokehouse Chef, I do not receive any benefits or “kickbacks” from them, and the links in this ad are to the product pages on Amazon if you want to purchase them. I do not benefit in any way from any of this, this review is simply for your information. I’ve gone through several meat grinders. Not because I break them or burn them out…but because they’re just not dishwasher safe, even if the manufacturer claims they are. And when you’re talking about grinding raw meat, sterility is absolutely paramount, so the idea that I can only wash the complicated parts of a meat grinder by hand using only mild soap, and NO rinses in a sterilizing solution like bleach or vinegar…none of that computes in my brain hole. Why do manufacturers even produce meat grinders that aren’t 100% dishwasher safe? The answer is “cost.” Aluminum is cheap and light, easy to manufacture, and therefore, cheap for the consumer. But it’s not dishwasher safe. And it reacts with acids and bleach, and the potent enzymes in modern dishwashing detergents. 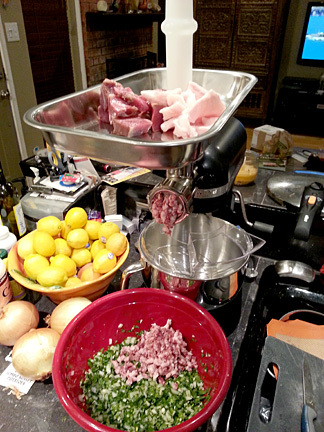 Meaning…it’s a TERRIBLE choice for a meat grinder. But it’s still the metal of choice for 99% of consumer-model meat grinders available today. Kitchenaid markets its own branded meat grinder attachment for around $50-$65, and states “most parts dishwasher safe,” and the manual for the attachment says to only handwash the blade and the grinding die in mild soapy water. While these are the smallest parts, making them easy to hand wash (though not, perhaps, safe…washing small, slippery, sharp objects can be dangerous), these parts directly contact the meat and I’d feel far more comfortable if they could be sterilized. 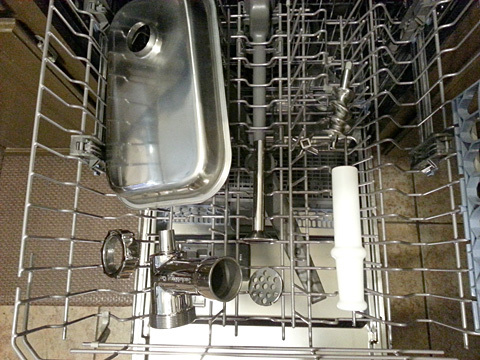 The auger and grinder body are primarily made of plastic, and can be washed in the dishwasher. Cabela’s all-stainless meat grinder…a $400 toy, but dishwasher safe. And I’ve been looking for a quality stainless-steel meat grinder ever since. I went through a few self-standing models that claimed to be dishwasher safe, or didn’t reference the dishwasher in their materials, but ended up NOT being dishwasher safe. (When they came out of the dishwasher, they were coated in oxidized grey dust.) And I was uneasy about the fact that I needed a massive, self-standing grinder taking up space in my garage, when an appropriate power source, the 1-horsepower motor on my pro-model Kitchenaid stand mixer, already takes up space on my counter. To be fair, Cabela’s produces an all-stainless steel self-standing grinder that is very popular among the hunting community, but their cheapest 1/2 horsepower model is over $400, and their cheaper models are not all-stainless and aren’t dishwasher safe. But I have twice that much horsepower in my Kitchenaid already…and I wanted an all-stainless steel meat grinder attachment for it…why is that an unreasonable request? Enter Smokehouse Chef, a small, family-owned Texas company that has been producing all-stainless replacement parts for OTHER manufacturer’s meat grinders, including Cabela’s and Kitchenaid. For years they’ve marketed an “all-metal” grinder attachment, but they must have heard my endless pleas to Kitchenaid, because they have just released a full stainless steel grinder attachment at the very reasonable price of $169 on their website. This is the only Kitchenaid meat grinder attachment currently on the market that is made entirely from stainless steel, and thus dishwasher safe. It is also cheaper than the grinder attachment manufactured by Chef’s Choice, which has aluminum parts and costs $150-$200! 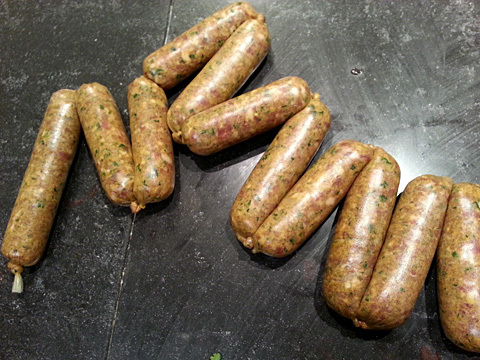 I was as excited as a kid on Christmas morning when it arrived on my doorstep, and within moments I had it opened, attached to my Kitchenaid, and I started making sausage with some venison I had in the freezer, and some pork fatback (the layer of pure fat from a pig’s back, normally used for making sausage). The first thing I noticed is that the hopper (the tray that holds the un-ground meat) is massive…way bigger than the Kitchenaid attachment. I had 4 pounds of meat and fat in there, and there was room for more. 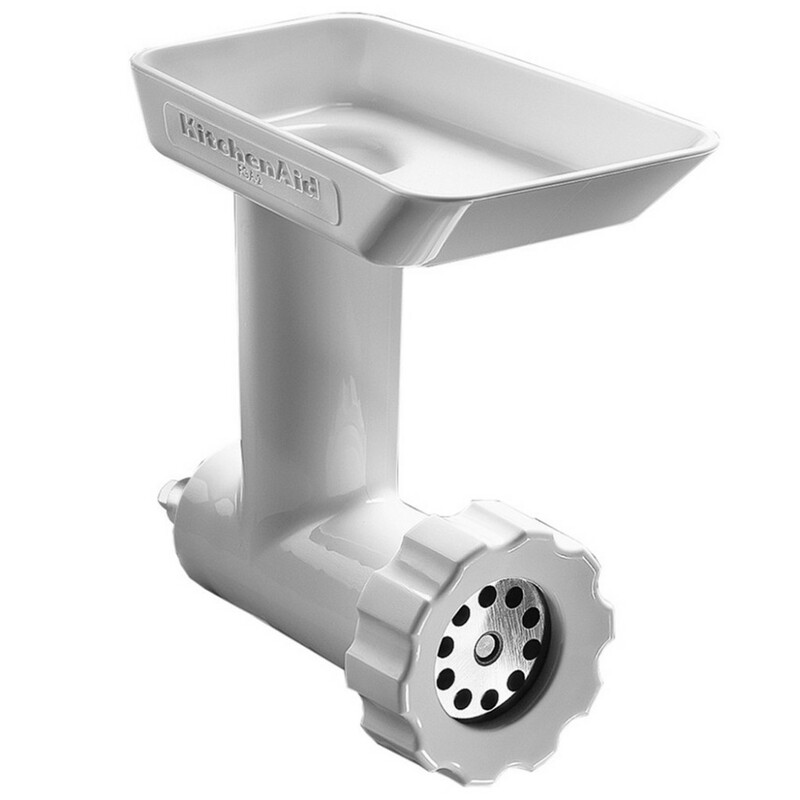 The plastic tamper that allows you to push the meat down into the grind cylinder is solid and easy to use. 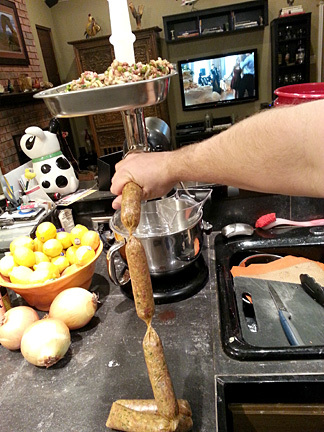 And the grinder performs flawlessly…the blade is sharp, and using the medium grind die (the grinder comes with 3 dies, fine, medium and coarse, as well as a stainless sausage stuffing sleeve) I got an absolutely gorgeous grind on the venison. After grinding 4 pounds of meat/fat, and then casing the resulting sausage, there was still no discernible heat on the grinder. 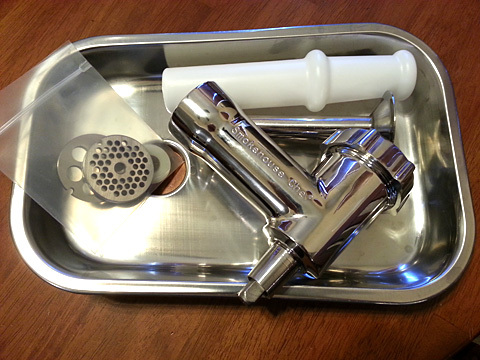 Meat grinders build heat at the surface where the blade contacts the die, and heating meat into the danger-zone where pathogens can rapidly multiply (40F-140F) can become a serious problem. On MasterChef, they had us combat this by adding ice to the meat as it was grinding, which seemed ludicrous to me…all that did was water down the meat. The way *I* combat heat buildup is to put the cubed meat and fat into the freezer for an hour before grinding, which also gives you a much better final grind texture, as the meat cuts more easily when it’s a little frozen. 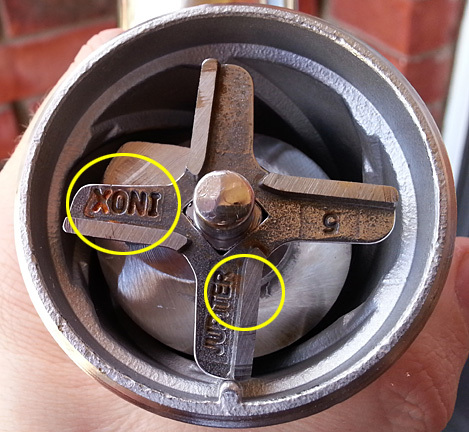 Everything came out spotless, with the minor exception of the blade, which had a tiny bit of rust inside the stamped logo. A bit of a disappointment, but understandable, as the stamping process creates heat and the friction between the stamp and the blade can create chemical reactions that change the properties of stainless steel. I brushed it well and spritzed on a bit of oil. If the rust continues to be a problem, I will update this blog as well as contact Smokehouse Chef. My only real beef with this grinder right now is that it comes without a manual or instructions, so if you don’t already know your way around a meat grinder, you’ll need to do a bit of internet searching and YouTubing to figure out how to assemble and use it. But that was no issue for me. All in all, I’m incredibly pleased with this grinder and I see lots and lots and LOTS of sausage in my future (no jokes please)! 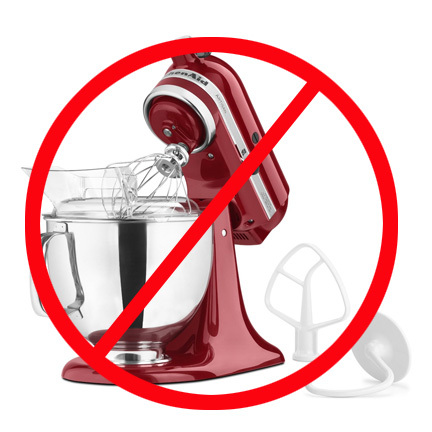 ***IMPORTANT*** Due to the stress that this attachment can place on the underpowered motor in the Kitchenaid entry-model, tilt-head mixer (the Artisan), I DO NOT recommend you use this attachment on Artisan mixers. For that matter, I don’t recommend this model to anyone for ANY reason. There’s just not enough power to do anything but beat egg whites and bake cookies. 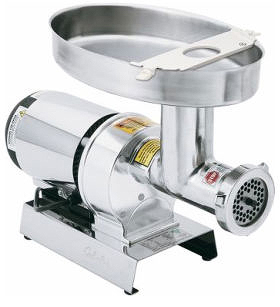 If you want to knead bread, or use the pasta or meat grinding attachments, you need a more powerful model. I highly recommend the version Costco sells, a 1hp 6-quart model, which is often available throughout the year at under $300 on sale and after a manufacturer’s rebate. This is the model we use at FRANK, where we often make pastas and knead breads for 18 people a night, 4 nights in a row. It is strong, whisper-quiet, and a great value. Feel free to comment below if you’ve had experience with any meat grinders that you can recommend or caution us against!